If you love trees and enjoy the benefits they bring to the environment, then come and join in the fun next Saturday (24th November). The creative Hills Road Residents Association is putting on an event to celebrate both National Tree Week AND the first planting of new trees. Cambridge City Council will be planting the first 4 of 44 new street trees in the grass verges in Hills Road — a mixture of Zelkova and Persian ironwood trees that are known for giving good autumn colour. The trees are being planted to take their place as the next generation of trees in Hills Road. Apart from their natural beauty, they will bring other benefits, notably mitigating the effects of climate change. City Council Tree Officer Matthew Magrath* will be speaking on why Cambridge needs more trees, and there will also be a talk by Cambridge’s Tree Ambassadors about why trees are important. There’ll be a chance to chat and to enjoy tea, coffee, cakes and biscuits too. Download more details here: Cambridge tree planting invitation .pptx. 11 a.m. Saturday 24th November, St John the Evangelist Church, Hills Road. Most trees in the City grow in gardens. So if you have space in your garden please consider planting a tree to enhance Cambridge’s unique urban forest. If you live in Cambridge you can also claim a free tree on behalf of your child of up to four years old through the Council’s Free Tree for Babies scheme. Happy planting. There’s another tree treat on 2nd December, when the Queen Edith’s Community Forum is holding a Tree Dressing Day, celebrating the contribution that trees make. They promise lights, decorations, songs and stories. 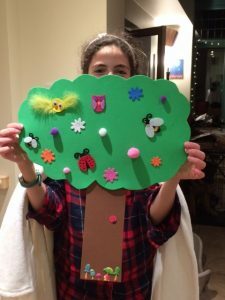 They are also asking us to come up with tree-related sayings, to hang on the trees — get your thinking caps on and post your leafy lines on the QECF Facebook page.